Its rare that a book appears with a fresh perspective on world affairs, but renowned economist Ha-Joon Chang has some startlingly original things to say about the future of globalization. In theory, he argues, the worlds wealthiest countries and supra-national institutions like the IMF, World Bank and WTO want to see all nations developing into modern industrial societies. In practice, though, those at the top are kicking away the ladder to wealth that they themselves climbed. Why? Self-interest certainly plays a part. 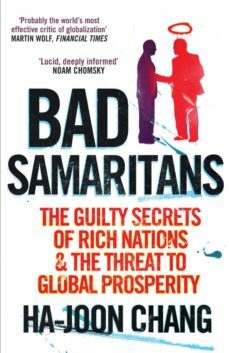 But, more often, rich and powerful governments and institutions are actually being Bad Samaritans: their intentions are worthy but their simplistic free-market ideology and poor understanding of history leads them to inflict policy errors on others. Chang demonstrates this by contrasting the route to success of economically vibrant countries with the very different route now being dictated to the worlds poorer nations. In the course of this, he shows just how muddled the thinking is in such key areas as trade and foreign investment. He shows that the case for privatisation and against state involvement is far from proven. And he explores the ways in which attitudes to national cultures and political ideologies are obscuring clear thinking and creating bad policy. Finally, he argues the case for new strategies for a more prosperous world that may appall the Bad Samaritans.